Our day started at Einstien Bagels for coffee and a bagel. We carpooled up to the mountains. 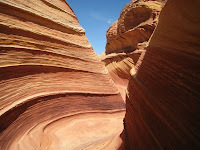 We drove up beautiful Parley's canyon, US 40, and through Brown's canyon. We stopped briefly at the country store in Oakley. 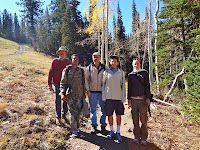 Then we went up the Weber Canyon road to Dave's cabin, enjoying great autumn views and Psalm 121. 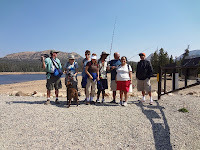 Several in our group went fishing at the reservoir. We hiked up trail 001 several. This trail will take you to the Mirror Lake Highway. 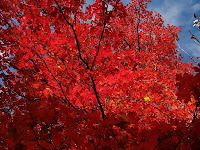 Jesus blessed us with wonderful fall colors, clean air, great friends and lifetime memories. Have your ever dreamed of going outdoors with Jesus? Doughnut Falls hike is great for the entire family. 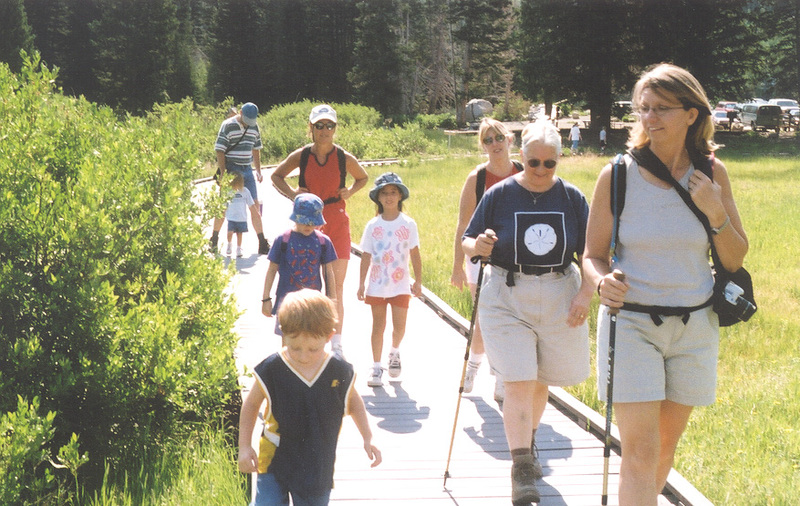 All ages of hikers will have a great time. God blessed us with a great day for this adventure. PARKING is limited at trailhead; please carpool. WATERSHED: No washing, no wading, and no dogs allowed in the canyon. DIRECTIONS: Drive up Big Cottonwood Canyon 9 miles to Mill D South Fork, turn right and stay on the road till you reach the trailhead. GEAR: Water, camera, energy snacks, and jacket. White Pine is at the lowest level in years. God gave us a great hike! GEAR: Plenty of water, sack lunch, camera, energy snacks, jacket, and hiking pole. WATERSHED: No swimming and no dogs allowed. Evening walks are cooler and less crowded. God blessed us with a wild dog hike. DIRECTIONS: Drive to the top of Millcreek Canyon and park. has the longer trail; while the upper has the short cut. God gives us friends so we don't have to share our adventures alone. Come out and join us sometime. DESCRIPTION: From the fishing parking lot, walk across the dam to the cabins, where you'll find the dirt trail. DOGS need to be on leashes. DESCRIPTION: This is a scenic tour, climbing up hills, going over boulders, and walking on logs. Going around the lake is difficult for kids and small dogs. GEAR: Always take a jacket, food, water, map, compass, and bug spray. DESCRIPTION: Mill D North Fork is a great hiking trail, going through a forest of firs, and walking by a bubbling stream. MILEAGE: 3.7 miles to the lake. HIKE TIME: 2 1/2 hours up and 1 1/2 hours return. RESTROOM: Available on the south side of the road, near the trail head. 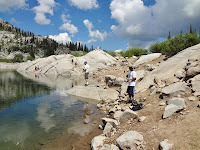 WATERSHED: No dogs, and no swimming in Big Cottonwood Canyon. 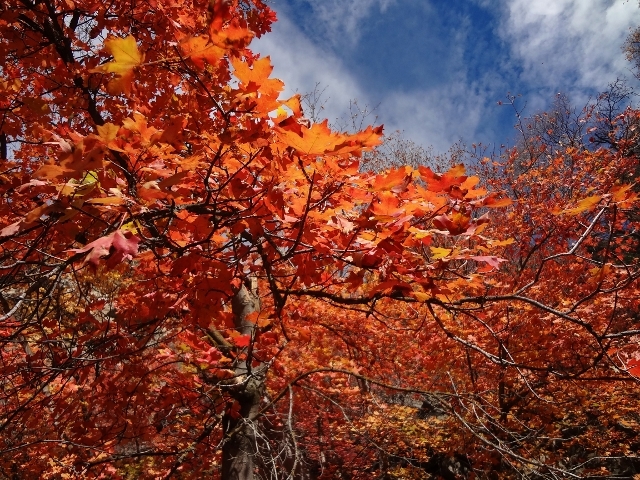 DIRECTIONS: Drive 8.8 miles up Big Cottonwood Canyon, from Wasatch Blvd, and Fort Union Blvd. (7200 South) Park on the north side of the road. Today we enjoyed hiking from Alta up to Cecret Lake. 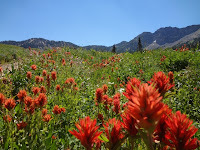 The wildflowers were great! God made some awesome mountains. We saw humming birds, chipmonks and other ground critters. 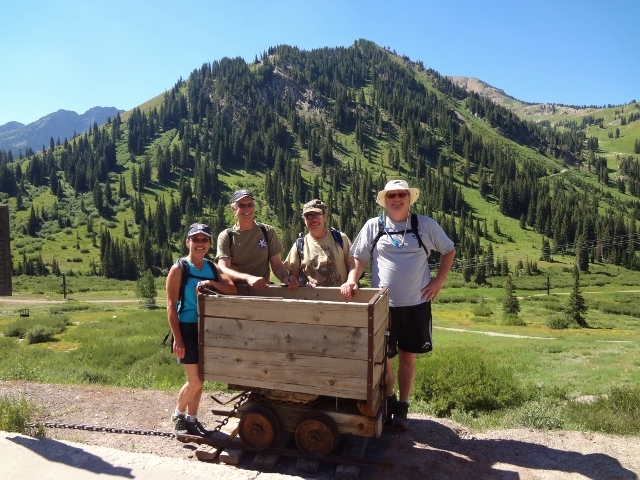 DESCRIPTION: Drive up Little Cottonwood Canyon to Alta to the booth, find a parking place down the hill, by the Alta Ticket Office where you'll find the trailhead. Follow the signs up to Cecret Lake. 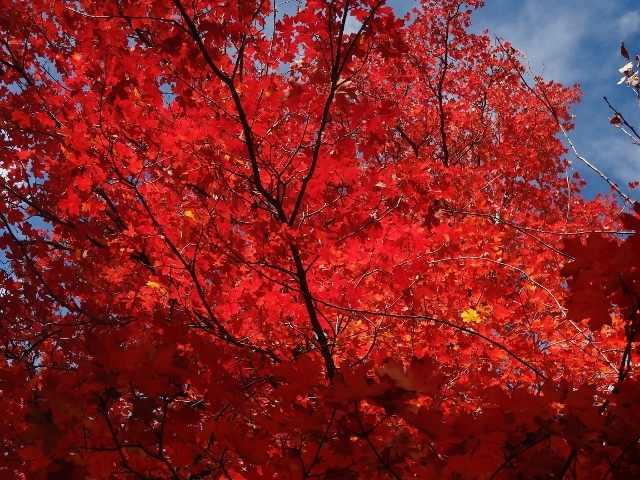 On the trail you'll enjoy reading nature signs, "SKE-COLOGY" and you'll find some comfortable benches at scenic overlooks. WATERSHED: No swimming, or wading in lakes or streams. No dogs! RESTROOMS: Available at the parking lot, and on the trail near Sunset Campground. God blessed us with a beautiful partly cloudy day on Bald Mountain. We enjoyed lunch and a reading from Psalm 95 on the mountain. If you enjoy taking pictures, this hike is a must!!! 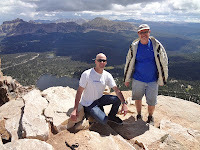 DESCRIPTION: Bald Mountain hike is a must for those who love the Mirror Lake Highway. 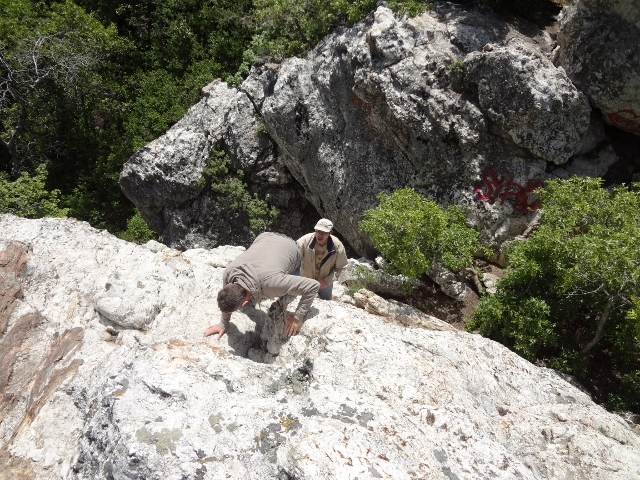 This is a rocky climb, with exposure, where you can overlook Mirror Lake below. RESTROOM: At the trailhead parking lot. HIKE TIME: 1 hour 15 minutes up; and 55 minutes down. KIDS must be supervised at all time, because of steep exposure. 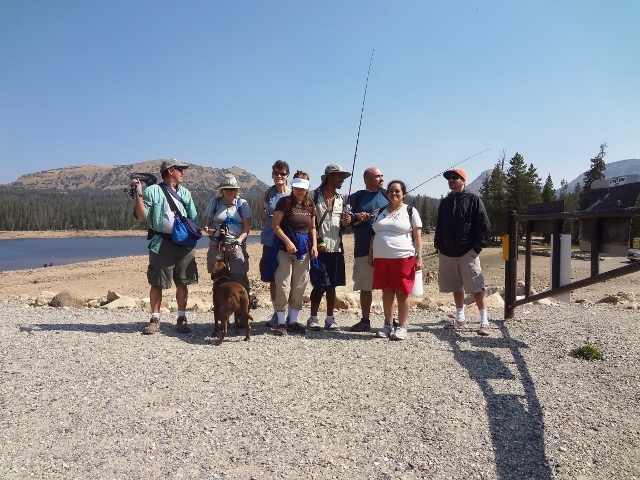 FEE: Mirror Lake Recreation fee is $6 or you can use your National Recreation Pass on a mirror hanger. GEAR: Water, jacket, bug spray, food, hiking pole, hat, and camera. 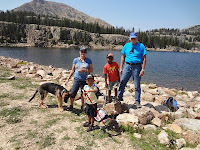 DIRECTIONS: From Kamas, Utah; take SR 150, 29 miles to Bald Mountain pass, and turn left into the picnic area/trailhead parking. 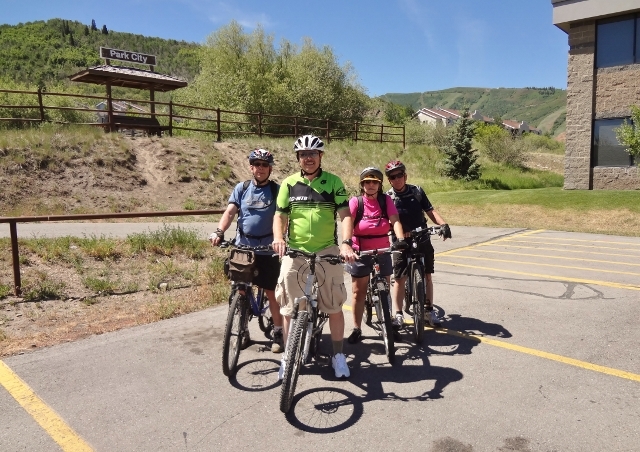 We enjoyed a wonderful bicycle ride in Park City. This is a fund raiser for the Good News Jail and Prision Ministry to raise support for the chaplain. We started at the Shepherd of the Lutheran Church, rode on paved and gravel parkway trails. We broke up into three different levels of riders. The advance group went 12 miles. After the ride we enjoyed a great barbeque, fellowship and prizes. 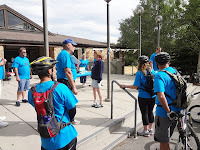 All riders received a blue t shirt, water and a granola bar. 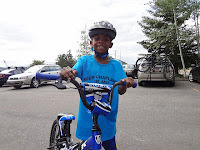 If you missed this bike ride, join us next year for the GOOD NEWS BICYCLE RIDE. 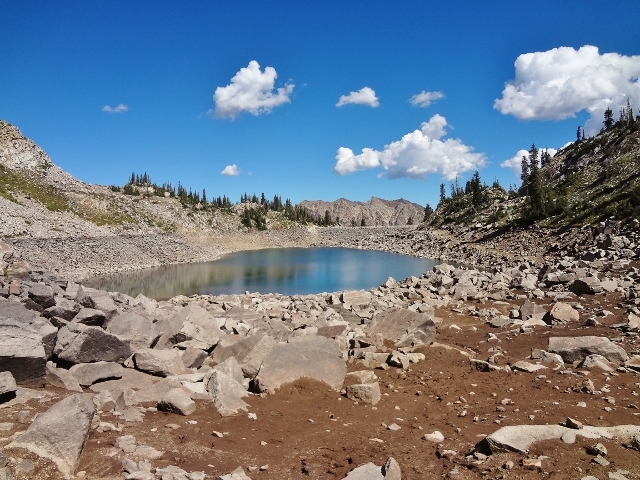 Lake Mary is the most popular family hiking trail in the Wasatch Mountains. Cool breeze felt like an air conditioner. 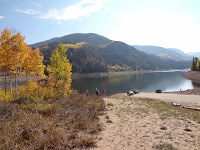 WATERSHED: No swimming, no wading allowed in the Cottonwood Canyons. 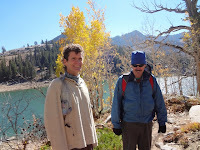 MILEAGE: 1 mile to the alpine lake. 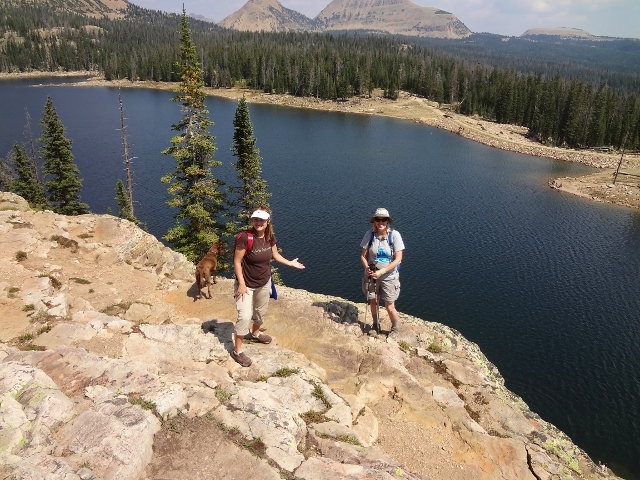 GEAR: Water, hat, bug spray, sunscreen, hiking pole, and energy snacks. PACK OUT all garbage and do not feed the animals. We celebrated the fourth of July by praying for our nation at Dave's cabin. 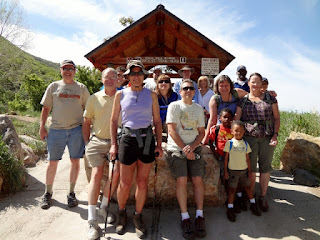 Then we enjoyed a hike from the marina to the Smith -Morehouse trail 001. 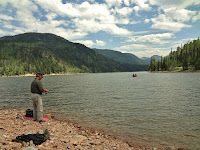 Afterwards our fishermen enjoyed catching trout in the beautiful reservoir. Today was a wonderful vacation away from the hot desert valley. 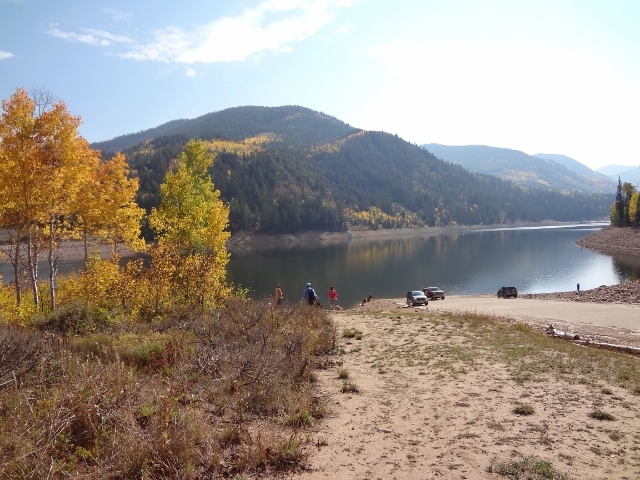 DECRIPTION: Park your vehicle at the boat ramp and walk south, down the road to the campground, where you'll take the closed road to the trailhead. RESTROOMS available at launch area and 001 trailhead. 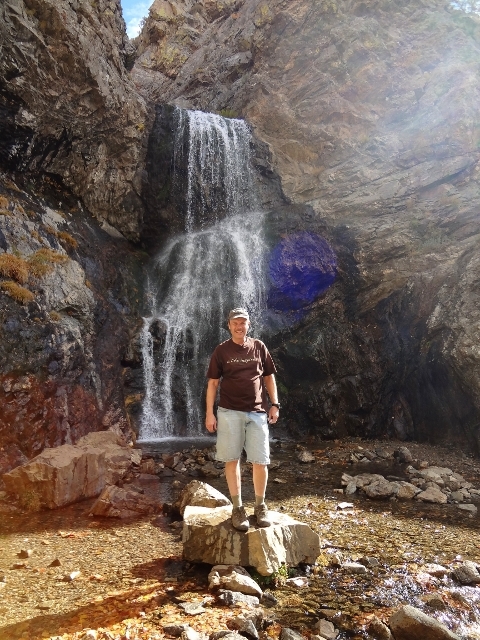 Sundance hike to Stewart Falls is one of the best hikes in Utah. It felt great getting soaked with ice cold water walking under the falls. God blessed us with an enjoyable day with great fellowship. 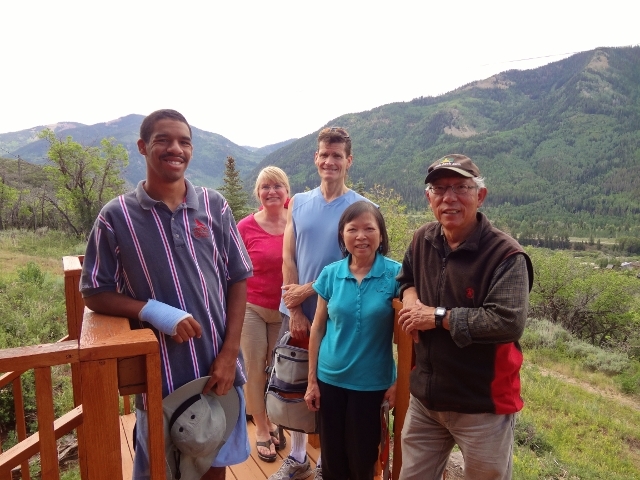 DESCRIPTION: Take a chair lift ride up Sundance and see scenic views. Make sure you get off the lift at the first place, and not ride the lift to the summit. Follow the trail signs to Stewart Falls. There are a few steep hills, make sure you bring a hiking pole. 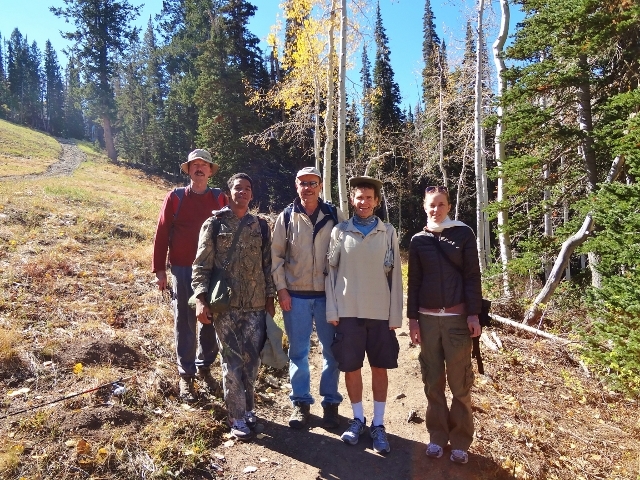 There was a crowd of one hundred people hiking the Aspen Grove trail to Stewart Falls, and about a dozen hiking on the Sundance trail. 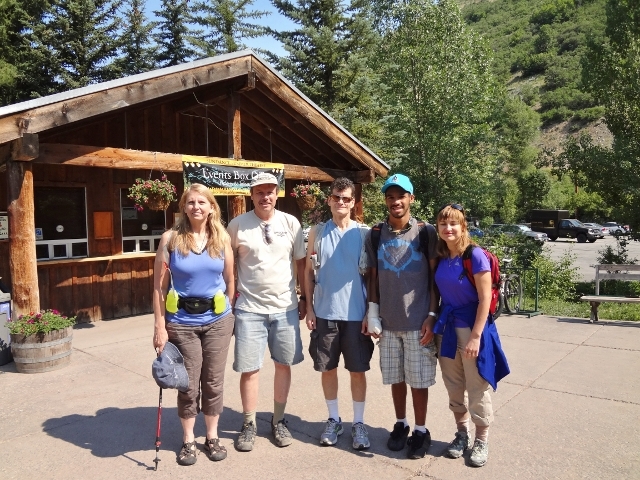 After enjoying the falls, take the trail down the hill back to Sundance. Don't take the Aspen Grove trail up the hill. CHAIR LIFT PRICE (1 ride) $11 adults, and $8 seniors. Drive up the canyon road and look for the Sundance sign, and turn left in parking lot. God blessed us with a great day in the mountains. It was sunny, and the wind blowing over the lake was like an air conditioner. 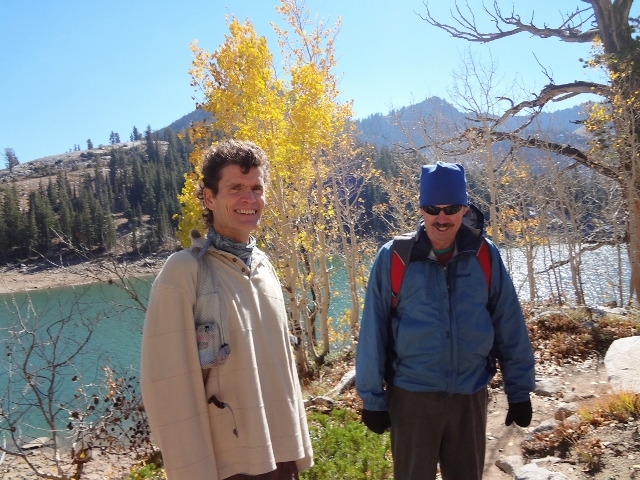 Twin Lakes Reservoir has been a favorite hike over the years. NO DOGS: Big Cottonwood Canyon is a watershed area. GEAR: Hat, sunscreen, water, energy snacks, camera, and hiking pole. God blessed us with a cool, sunny day. On this Mystery Tour, we saw Zebra, cows and birds. DESCRIPTION: Our ride included the Union Pacific Rail Trail, Park City Parkway, Silver Glance, some city streets, and return on the Rail Trail to Park City. GEAR: Helmet, pump, flat repair tools, water, sunscreen, energy snacks, and first aid. When Salt Lake becomes a scorcher, City Creek Canyon offers afternoon shade, by a beautiful creek. This is a great place to be with Jesus. And a fun ride down the hill. ODD days the road is gated in the Summer from Memorial Day to the last even day in September, for bicycle riders, joggers, and pedestrians. EVEN days the gate is open for folks to drive up the canyon for picnics. 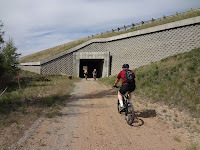 DESCRIPTION: A great endurance bicycle ride, up a paved canyon road. MILEAGE: 5.5 miles up paved road to gate. RESTROOMS and drinking fountains are available in the canyon. DOGS: Are allowed below the water treatment plant, if they are on leashes and you clean up. Beware of poison ivy and snakes in the canyon. DIRECTIONS: Drive up B Street to 11th Avenue, continue on Bonneville Blvd. (one way). Parking is limited by the entrance gate. Pull off parking is available 6am to 10pm. 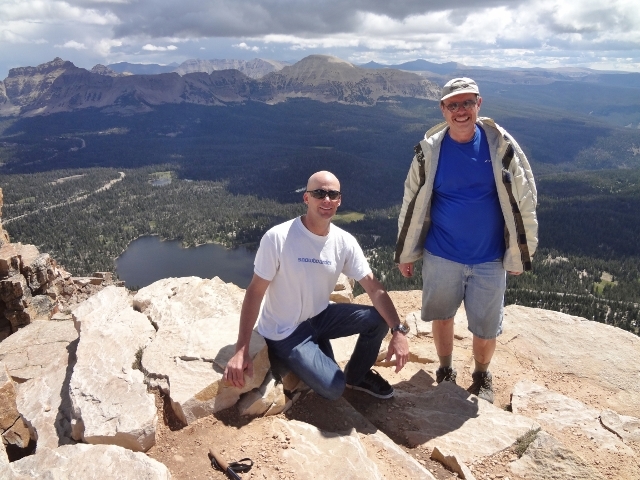 God gave us a great hike on Memorial Day, full of adventure, great views, and wonderful friends! 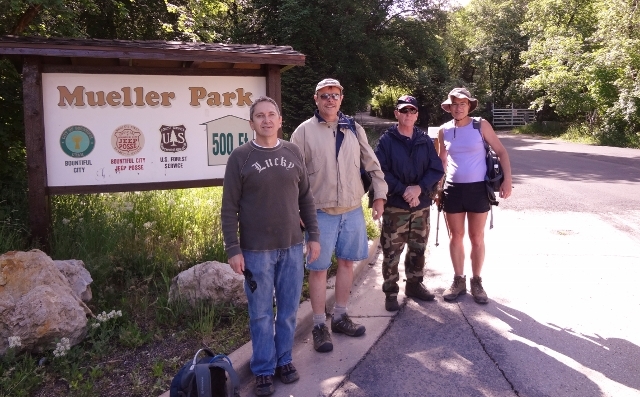 DESCRIPTION: Mueller Park is a great trail for hiking with your family, walking your dog, or mountain biking. 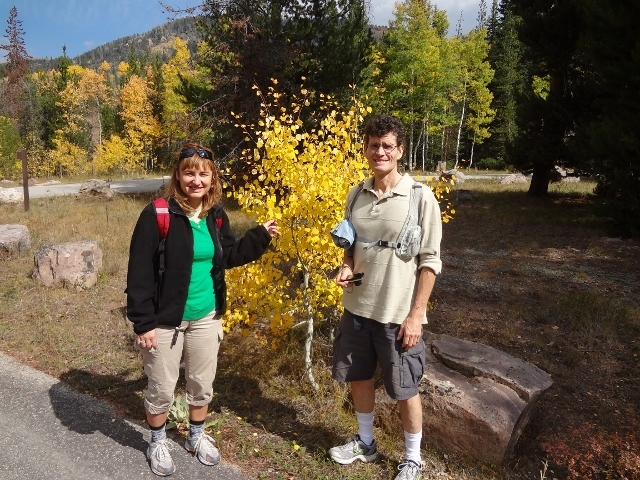 This trail is similar to the Dog Lake trail, in Millcreek Canyon. There are two benches at the overlook. 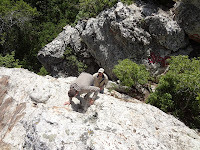 Climbing Big Rock can be technical, with sheer drop exposure. MILEAGE: 3.5 miles each way to Big Rock overlook. DOG OWNERS need to clean up. DIRECTIONS from SLC: Take I-15 exit 315, 2600 South, drive up the hill and the road curves left becoming Orchard Drive (north), turn right on 1800 South and drive straight to the mountains. Park outside Mueller Park at Maple Ridge Drive and Mueller Park Road. The trail begins across a wooden bridge and is free. The picnic area there is a $5 walk-in fee or $8 per vehicle up the paved road. 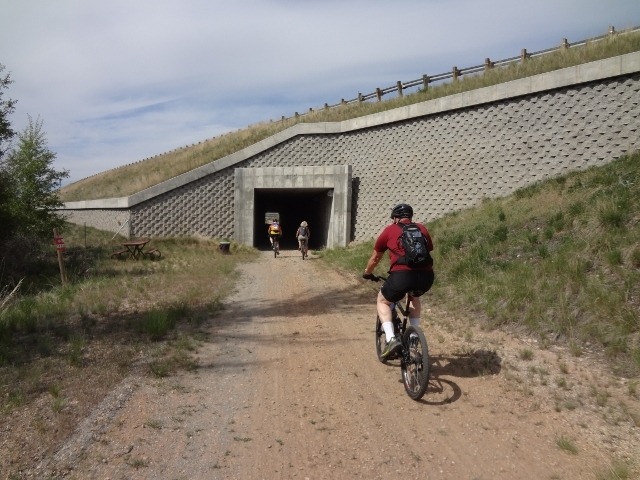 A wonderful ride on the Historic Union Pacific Rail Trail. We saw cows, horses, a fox, a cat, song birds, and lamas, as we rode by farm land. God blessed us with a solar eclipse this evening at 7:29pm. 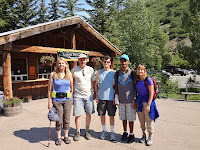 Some of us ate out at Park City after the ride, and viewed the partial solar eclipse. DESCRIPTION: This is a great endurance ride for mountain bikers. RATINGS: Moderate on dirt and gravel doubletrack. RIDE TIME: 1 hour to Coalville, 1 hour 20 minutes return. DIRECTIONS: From SLC, take I-80 east, take the Wanship exit, turn left and travel through town, until you see a parking lot with a restroom. GEAR: We highly recommend thorn liners to protect you from gettting a flat. Water, sunscreen, helmet, pump, water, sunglasses, camera, energy snacks, and flat repair tools. 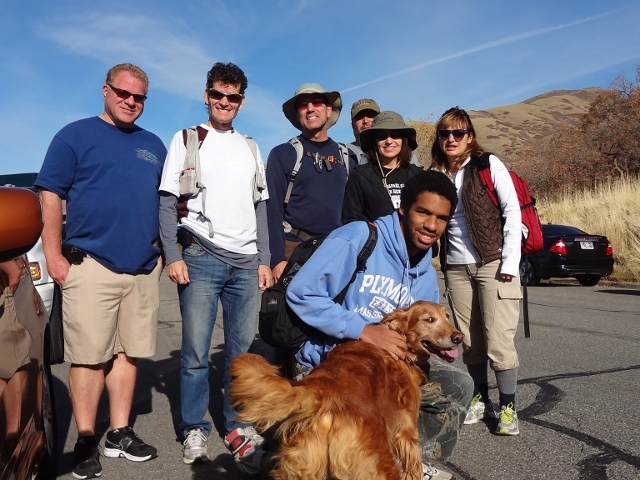 A great day hiking with Jesus and good friends! 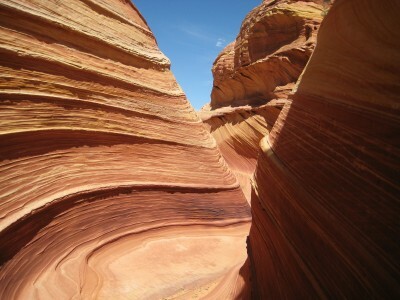 DESCRIPTION: Go up to the Bonneville Shoreline trail, turn left, this will take you around the scenic way. We stopped at a spring, then hiked up to an overlook. 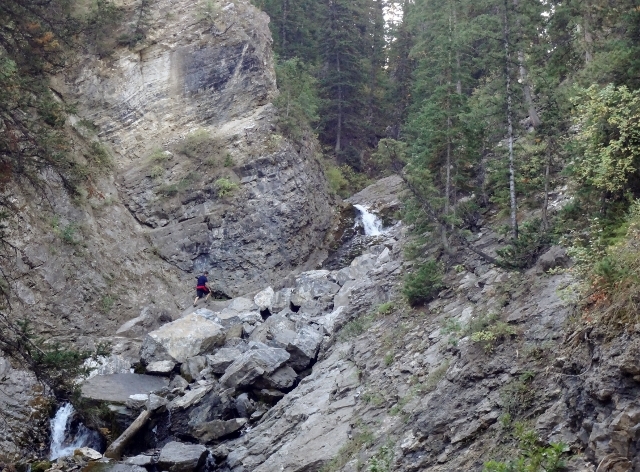 Then we entered into Waterfall Canyon. A hiking pole will help you through some of the rocky areas. You'll enjoy hiking by a stream. MILEAGE: 2 miles up the long way, 1.4 miles down the short trail. KIDS love this hike, but must be supervised. DOGS are allowed on leashes. Owners must clean up. HIKE TIME: Allow 4 hours to enjoy the hike and falls. RESTROOMS: flush restrooms at the trailhead when the door is unlocked. DIRECTIONS: Take Harrison Blvd in Ogden, drive up 30th Street, and find your way over to 29th Street. At the foothills you'll find the trailhead parking. GEAR: Don't leave garbage at the falls...pack it out! Bring plenty of water, energy snacks, sack lunch, hiking pole, sunscreen, jacket, first aid, and camera. HIKE TIME: We spent 8 hours playing in the desert. GEAR: Sports drinks, camera, jacket, lunch, water, salty food, sun protection, hat, maps, GPS, and a permit. PERMITS: Each month there is a lottery for four months in advance. Only 10 persons per day will be given a permit from the lottery. If you can't get a lottery permit, you may try for a Walk-In permit. Show up at the Paria BLM visitor center the day before you want the permit; and they will have an early morning drawing for permits. DIRECTIONS: Because this is a protected area, you'll have to get this info from the BLM office. A beautiful Spring day with Jesus! 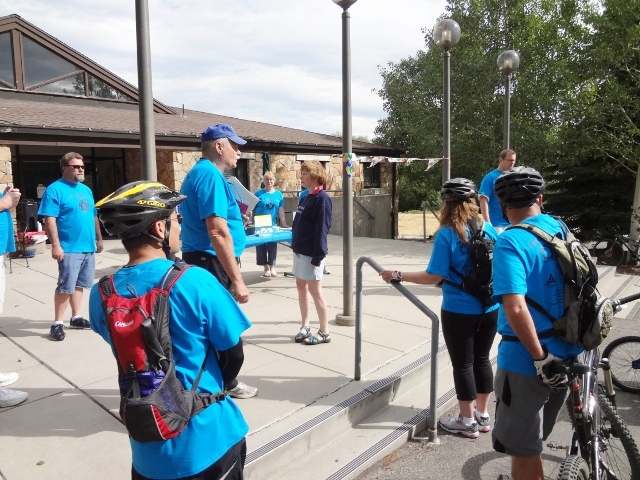 Some of the group rode the causeway; while other began at the visitor center. There were a lot of folks on the Island, because of the Bison Run marathon. We saw bison too! DESCRIPTION: Ride down the hill to the beach area, and climb up to Buffalo Point. Lock your bicycle up and hike up to the top. Enjoy a lunch break. Ride down to the causeway and stop at the Memorial. Then return to the visitor center. MILEAGE: 7 mile loop, or 21 miles if you ride the causeway. GEAR: If you are riding a mountain bike, we recommend thorn liners and slime tubes. There are goat head thorns in the desert. Bring water, sack lunch, sunglasses, bicycle lock, pump, bicycle tools, extra tube, sunglasses, sunscreen, wind breaker, and a hat for hiking. RESTROOMS: Are available on the Island. DIRECTIONS: From I-15 take the Antelope Island exit in Syracuse, and drive west to the Great Salt Lake. STATE PARK FEE: $9 per vehicle, or $3 per bicycle entering Island. The winds were howling in the Salt Lake Valley; but God blessed us with a wind-free, partially sunny day in the mountains. Today we found a snow fort on the trail. 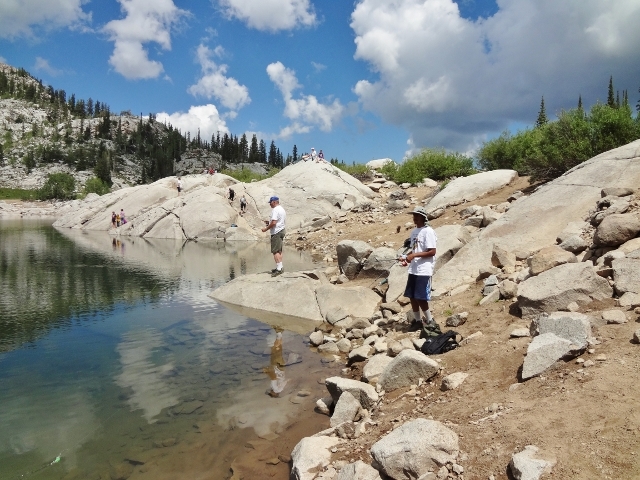 NO DOGS: Big Cottonwood is a protected watershed area. 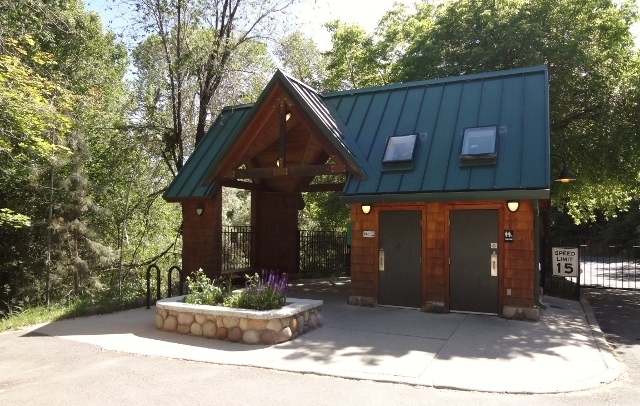 RESTROOMS: They locked the restroom by the Big Cottonwood road. GEAR: The snow is soft, and wearing your snowshoes are a must. Bring poles, water, energy snacks, sunglasses, sunscreen, hat, snowboots, and dress in layers. DIRECTIONS: Drive up Big Cottonwood Canyon to Mill D South Fork and find a place to park. Follow the cabin road up to the Doughnut Falls trailhead. God blessed us with a beautiful warm, blue sky day. The shade was cool, but when you where in the sunlight, it was warm enough to peel off your jacket and gloves. DESCRIPTION: Drive up Millcreek Canyon to the gated road, where cross country skiers, snowshoers, and hikers enjoy. We hiked up to the 2 mile marker and back. 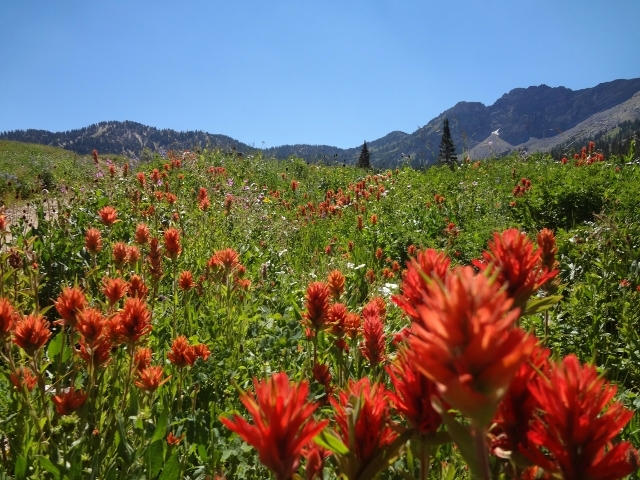 RESTROOMS: Available at trailhead, and Elbow Fork trailhead. DOGS: Must be on leash even/odd days on the road. Dog owners need to clean up after their pets. Even if it is snowing, you can still have fun in the mountains with Jesus! Instead of going all the way to Doughnut Falls, we took a shorter hike. DESCRIPTION: From Mill D South Fork, hike up the road toward the Doughnut Falls. At the trailhead, is a locked restroom. We hiked up the Cardiff Mine road, until the Doughnut Falls trail crosses a bridge and joins the road. This is our turn-a-round. We took the steep path down, through the woods. DIRECTIONS: Drive up Big Cottonwood Canyon, Fort Union Blvd & Wasatch Blvd. in Salt Lake City, Utah. Park at Mill D South Fork. God blessed us with a another great day in the mountains. We heard birds in the fir trees, saw a snowman, and even climbed a steep hill. RESTROOMS: Available at parking area, and Winter camping areas. GEAR: Snowshoes, poles, sunglasses, hat, gloves, water, dress in layers, energy snacks, etc. DIRECTIONS: Drive up Big Cottonwood Canyon to Mill D South Fork. 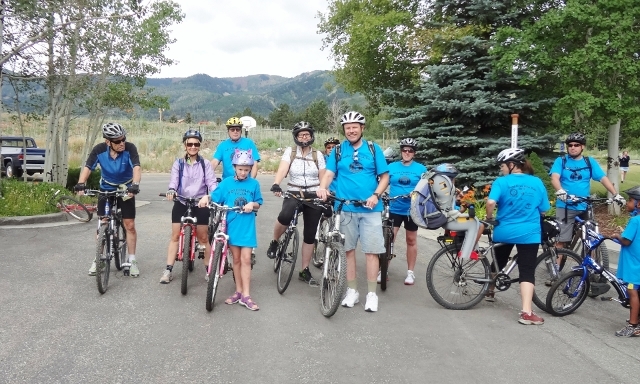 ﻿OUTDOORS WITH JESUS began the Summer of 1986 as an informal, free hiking and mountain biking club based in Northern Utah. The club is open to both single and married adults. And believers and non-believers are welcome to attend. If you want to find out about our upcoming activities, and exciting community events, you need to join our free email newsletter. Each person needs to join for themselves. Don't forward our email, just have your friends join for themselves. No spammers are allowed to join. Do not add us to any mailing list without first contacting us. Send us an email, subject line: "Subscription" and in your email we need your first/last name, town/city where you live, and your outdoor interests if any. If you like to hike, snowshoe, camp, mountain bike, or just want to receive community announcements. This helps us plan activities in your community; and protects our email account from spammers. 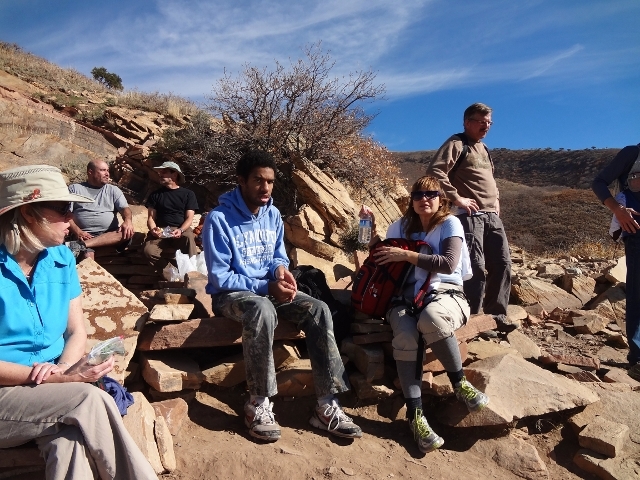 When you receive the OWJ HIKING NEWS, make sure you add our email to your safe sender list and address book. Otherwise, it will be deleted or sent to your spam folder. KNOW OF A GREAT TRAIL? Please let us know about great hiking, and mountain bike trail in your area. We have explored Salt Lake, Ogden, Park City, Heber, Kamas, Oakley, Grantsville, and scenic places in Utah. And have a spiritual attitude! 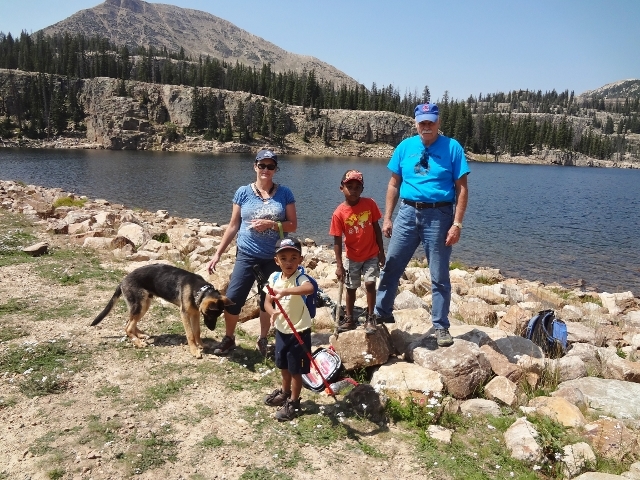 Open to single and married adults able to participate in outdoor activities. Your children and teens may attend our easier activities if you assume full responsibility and supervise them. Subscribers are not members. Even though membership is free, to be an active member in 2012, you must sign a release/waiver and participate in a 2012 activity. Even though the membership may be free, you'll have to pay all park fees, carpooling, camping, and bring your own water, food and gear. 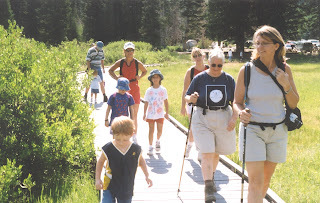 NEWBIES ~ Great for kids, beginners and slow hikers. MODERATE ~ More challenging activities at your own pace. INTERMEDIATE ~ Faster, longer, steeper at your own pace. TECHNICAL ~ Mountain biking on rocky, challenging trails. We're not an outfitter. Each person attending must plan, pack and bring the necessary water, food, first aid, and gear for each event. If you arrive late, try to catch us at the trailhead. Activities may be cancelled to bad weather, closed roads, trail closures, weddings, and vehicle breakdowns. If the leader doesn't show up 15 minutes after departure time, it has been cancelled. Don't let it spoil your day, go hiking anyway with the people there. Hiking, mountain biking, snowshoeing, cross country skiing, camping, backpacking, and other outdoor activities have dangers and risks! You need to look out for your own safety, and make your own decisions. All attending need to fill out a release/waiver card for 2012. 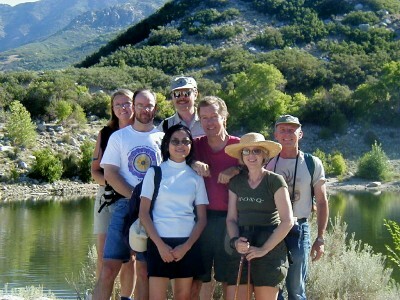 Outdoors with Jesus is a network of outdoor people along the Wasatch Front. It is your contribution of participation, and prayer support which allow us to exist another year. 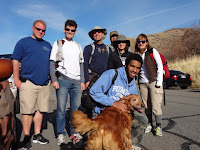 Some people are leaders and can help us lead a hike. Each person has a talent they can contribute, whether if you know wildflowers, trees, animals, gps navigation, or the gift of helps. The most popular snowshoe hike in Big Cottonwood Canyon is to Doughnut Falls, up Mill D South Fork. God gave us a sunny blue sky day and no clouds in the sky. Everyone who came had a fun time. 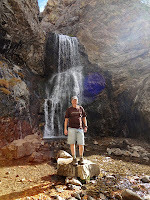 From the Big Cottonwood, you hike up Mill D South Fork up the road to the Doughnut Falls trailhead. We followed the trail up; and on our way down we followed the mine road down. 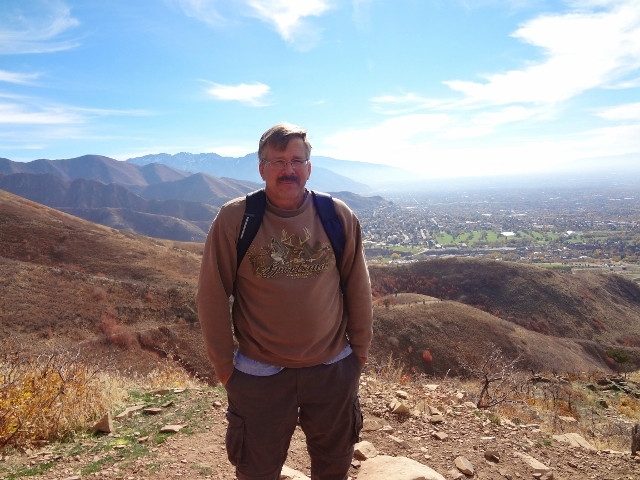 Great day to enjoy a hike up the Millcreek Canyon road. God blessed us with a cool, sunny day. And during Martin Luther King Jr. weekend, there are no canyon fees. There were a lot of cross country skiers on the trail and dogs. HIKE TIME: We hiked 1 hour 15 minutes up and 45 minutes back. 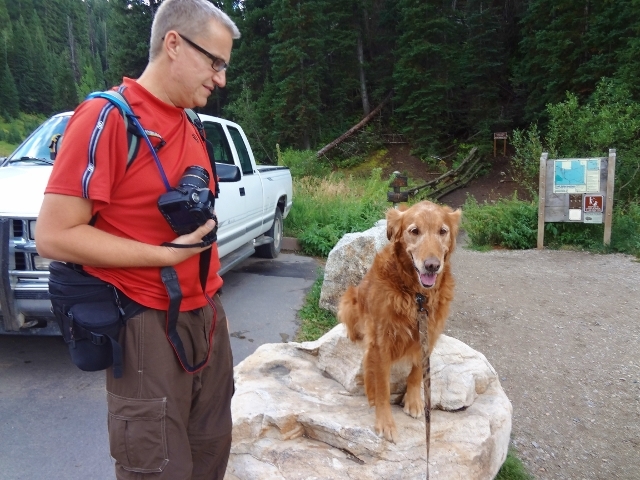 DOGS allowed but must obey Millcreek Canyon rules. KID FRIENDLY: Some parents pulled kids on sleds. RESTROOMS available at trailheads. Bring toilet paper. GEAR: Snowshoes, poles, dress in layers, water, sunscreen, sunglasses, hat, gloves, snowboots, camera, and energy bars. Drive up the road to the gated road and find a place to park. Good friends encourage their friends to get out and enjoy the outdoors and not stay home. God gave us fresh snow, fun fellowship, and a sunny day in Snowbasin. 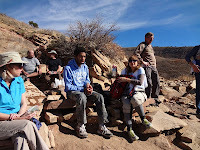 We had an enjoyable lunch on the trail and hiked up to the ridge. DESCRIPTION: From the Maples Trailhead, we hiked the road up to the ridge; and hiked back on the telephone pole trail. At pole #37, the trail drops back to the trailhead sign. GEAR: Snowshoes, poles, dress in layers, water, energy snacks, camera, insulated gloves, snow boots, wool socks, and sack lunch.